Professional Handyman Services in Camden. Do you need urgent help for your clogged kitchen sink? Try out the professional handyman services offered by Thomsons Cleaning expert company. Our services are preferred by both domestic and commercial customers in the entire Camden NW. We can assist you with simple maintenance jobs, repairs and various odd jobs around the office or house. Our handymen are all reliable, vetted and multi-skilled. They can perform several handyman jobs at one visit, if you have booked sufficient hours. It is an hourly based service. To get a price estimate or quote, contact our 24 hour customer care at 020 3746 0000 or send us an online request here. Our company Thomsons Cleaning has a number of multi-skilled handymen, who can provide you with a wide variety of improvement, repair, maintenance and odd jobs for your home or office if you are located in Camden NW. The best part is that they can provide more than one handyman job at one visit - especially if you book them for half a day or a whole day, which will bring you special discounts. 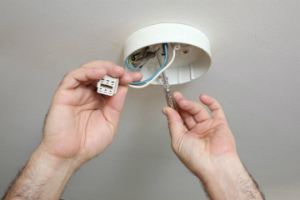 Our handyman services are completely covered by insurance. We can provide you a wide variety of renovation, repair and maintenance tasks, as well as an infinite number of odd jobs around your home or business premises. The plumbing handyman services in Camden NW mainly include the fitting and repair of toilet seats, shower screens, bathtubs, sinks, etc. Wall mounting handyman services include the mounting and hanging of small or large pictures, whiteboards, maps, TV’s, curtain fitting, blind fitting, curtain rails, shelf mounting service, etc. The electrical handyman services can include: light installation and repair of ovens, kitchen appliances, electric oven hoods, extractor fans, switch repairs and more. The renovation handyman services we offer can include: painting, plastering, fixing cracks in walls indoors and outdoors, placing or fixing grout and tiles, etc. The furniture assembly services provided by our handymen include assembly of all kinds of furniture from the following brands: Asda, Aspace, B&Q Dwel, Habitat, Harveys, Furniture 123, Heals, IKEA, Homebase, Ilva, John Lewis, Argos, Papas & Mamas, Peter Jones, Tesco and more. If you need assistance for one or more handyman services - go ahead and book our professional service now! Our handyman are skilled and can do multiple handyman jobs, so you can book them for more than one job. Some of the more popular handyman jobs offered in Camden NW include: floor fitting, picture or TV hanging and mounting, furniture assembly and disassembly, painting, fitting safety baby gates on staircases, sink, toilet, electrical, bathtub fitting, various plumbing, carpentry and other maintenance and repairs. The odd jobs which we can do for you include: tidying up your IT and cables, fallen or broken tile replacement, seal doors and windows, repair toilet seats, repair door lockers and handles, adjust the hinges of cupboards, fit a shower screen, put up signage and many more tasks, which you may not have the tools, the time or the skills to do by yourself. If you want to reserve our handyman services in Camden NW, simply call 020 3746 0000 or send us an online booking request here. Our customer service is ready to process your booking request 24/7. You will soon receive a written confirmation for your booking as a text message and e-mail. Without deposit for booking. Special discounts are available if you book a full-day or half-day handyman package. Also, you will get a discount if you book another service along with our handyman service together. The price is fixed, so don’t worry about invisible taxes. We are available for same day booking in cases of emergencies, or you can pick any other day of the year to book our services. Book now! Early bookers get preferential prices.